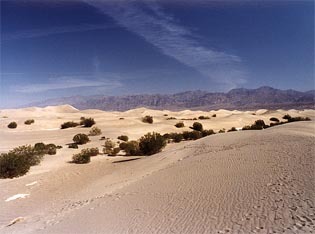 The Mesquite Dunes of Death Valley. Photo by Benjamin Mendelsohn. The pink salt crystals below were created by artitst Jorg Lenzlinger for the Exploratorium's "Turbulent Landscapes" exhibition To create your own salt crystals try "Crystal Creations II" from the "Science Explorer Out and About" publication. Death Valley is well known for its extremes. It is home to the lowest point in North America but has also had the highest recorded temperature on the continent (134 degrees Fahrenheit--in the shade--at Furnace Creek on July 10, 1913. The geological features of Death Valley can not help but display the effects of these extremes. Strong winds, evaporation, seismic activity, erosion, and even volcanic eruptions play a role in shaping Death Valley. There are massive salt deposits, huge craters, flat playas, and impressive mountains--Telescope Peak towers two miles above the valley floor. This winter I visited Death Valley and found myself in awe of these extraordinary geologic wonders. To better understand what I saw, I called geologist Allen Glazner, coauthor of "Geology Underfoot in Death Valley and Owens Valley"; his comments (in text and RealAudio) appear throughout this article. "Geology in a Land of Extremes"
Last Issue: "Project SERENDIP: Searching for Life in the Cosmos" by Ron Hipschman, "Two Cool Interactive Exhibits: Build a Solar System" and "Your Weight on Other Worlds." I have been fortunate enough to visit Death Valley four times in the last few years. It's always been a place for friends and family to get together and enjoy nature. Each time I've visited, I've learned something new about the valley and it's great to have the opportunity to share some of those experiences. I'd like to thank Allen Glazner, coauthor of "Geology Underfoot in Death Valley and Owens Valley" for his time and his insight into the geology of Death Valley.